Are you playing along with Big Picture Classes 10K challenge? The challenge is to get 10,000 layouts posted with the hashtag "#NSD10K" today. So fun! I made a couple of cards, and only 1 layout. 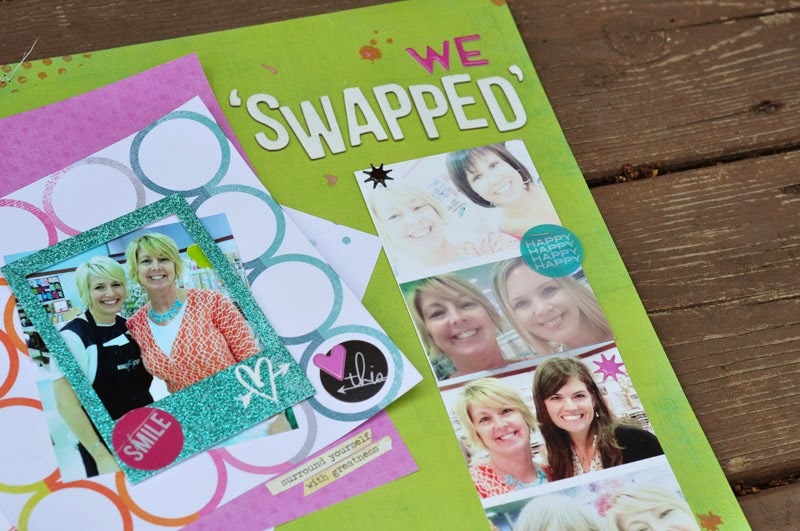 This layout celebrates the classes I took taught by Heidi Swapp just last week. Have you ever taken one of Heidi's classes? If you haven't you should! There is not only a ton of creative, awesome Heidi ideas jammed into the class, but a heartfelt message as well. I've taken a total of 5 classes (2 different 2-day sessions) and walked away inspired to be a better person after each class. One of the things I love about Heidi's classes is being surrounded by other Heidi groupies. I've come to know quite a few of fellow fans through social media. At this particular class I had the honor of meeting a few of the girls I've met through InstaGram. Jill (who lives just a few miles from me) and Laura. I made another friend, Joyce who I got to know in class. It seems to me that Heidi has some of the sweetest, genuine and fun fans! I'm sure you see sweet Maggie in the photos too. She and Sara were so helpful and fun. Donella was another friend that we made last year at another Heidi Class. She is so sweet. I also got to meet several other girls, but didn't get a chance to get photos - We were super busy trying to take in all of Heidi's amazing ideas. So, keep an eye out for a Heidi class near you. It's worth the drive, I promise you! Oh.. and don't forget papertowel... you're going to use a lot of it!! :) It ain't easy making "Pretty Stuff".